Open and honest, Sophie Allison, who records as Soccer Mommy, makes her studio debut on “Clean” with a chronicle of teenage life through the perspective of someone seemingly older and wiser. Allison, at 20 years old, confronts love and adolescence head-on, with meditative lyrics that make her experiences feel universal. “Clean” is the culmination of a quick and unexpected rise to popularity from bedroom pop— which is when musicians record at home rather than at a traditional studio—to a label release. 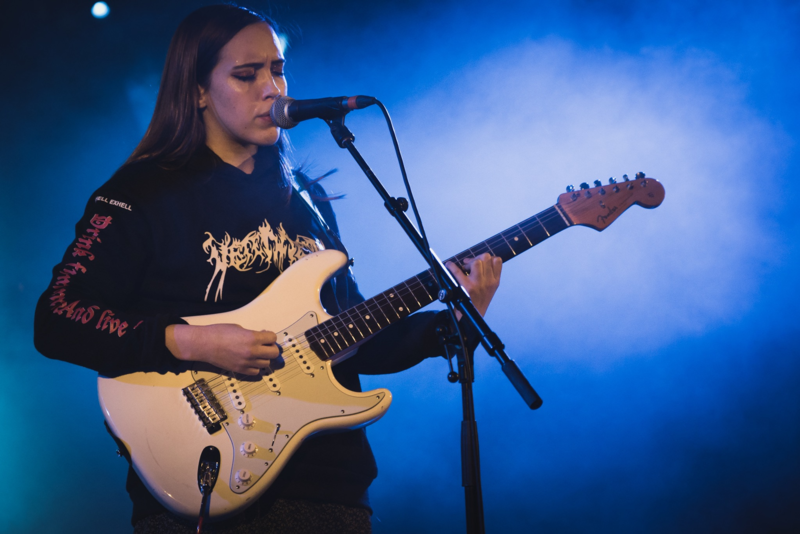 Soccer Mommy started as a one-women project based out of Allison’s Nashville bedroom and publicized through Bandcamp releases. Her ability to articulate specific frustrations about the realities of growing up gives her music a relatable quality that propelled it into popularity before she even signed with Fat Possum Records. She has released one prior work with Fat Possum, titled “Collection,” which functions mainly as a reworking of her previous releases from Bandcamp. “Clean” marks a change from her previous releases— it is her studio debut, made after she dropped out of New York University as a junior to pursue music full time. The intention and skill born of this change can be seen throughout “Clean,” with lyrics that pierce the audience and arrangements that evoke nuanced emotions. “Clean” opens with “Still Clean,” a hazy track that retells the disappointment of a failed relationship. Here, Allison uses sparse lyrics and layered guitars to create an aching aura, as she understands she has been left behind by the other person in the relationship but still wants and waits for them. Allison also hints at her lofi, bedroom pop roots by inserting a demo take near the end of the song that has the fuzzy, unfinished quality that characterizes so much of her early work. While “Still Clean” keeps a steady pace and features a consistent arrangement of instruments, “Cool,” the second track off the album, comes in decidedly more uptempo with a single quick guitar strum before breaking into a more full-bodied piece. “Cool” addresses a common teenage narrative of wanting to be someone you’re not, of wanting—as Allison puts it—“to be that cool.” Allison seemingly idealizes a girl that does not fall to the same pining tendencies that she expressed on “Still Clean”—while Allison is hung up on a former significant other from a long-over relationship, the girl she venerates on “Cool” “won’t ever love no boy.” This girl comes back on the third track, though, to demand autonomy from an obsessive and restricting partner. Allison hones her lyrical power on this song to condemn an emotionally abusive relationship, stating, “I’m not a prop for you to use/ When you’re feeling lonely and confused.” Allison also makes full use of the arrangement here, with guitar riffs calling back to her in corroboration of her testimony throughout the song. The pace of the album once agains slows down on “Flaw,” the most intimate song yet. Here, Allison addresses her own infidelity outright with small details that are nevertheless highly personal. Although she explicitly admits to the infidelity, she continues to displace the blame for it, saying she chooses to “Blame it all on [them]/‘Cause I don’t like the truth.” With these lines, she highlights how relationships can really bring out the complicated and contradictory nature of human beings. “Blossom” marks the halfway point of the album, with a renewed Allison focused on finding a reciprocal love on this stripped-down track. Almost the entirety of the song rests on her voice and the slow strums of an acoustic guitar, accented with a deep bass in the middle of the song. The simplicity forces the audience to focus on the lyrics and comprehend that this is a pivotal point, the start of a bloom, on the journey of this album—Allison is now able to make peace with the type of unrequited love detailed on “Still Clean” and realize that she deserves something more. “Last Girl,” the next song, echoes the writing format of the former song: it is a song written in situ, while wracked with negative emotions, and it plays on the same idea of “Cool.” In “Last Girl,” Allison openly bears her insecurities as she wonders if she is not enough while comparing herself to her partner’s last girlfriend. Delightfully intimate, “Last Girl” manages to put universally understandable lyrics to the feeling of jealousy. The multiple layers of guitar and heavy drum backing on “Skin” pushes one of the more rockheavy pieces forward; the song captures a wash of negative emotions as this musical progression takes place. Here, Allison recalls being consumed by an obsessive crush while also trying to act cool and detached. This idea of simultaneously being too involved and too cool recurs throughout the album (“Cool,” “Last Girl”) and shows us the dangerous adolescent trend of trying to be something you’re not. “Scorpio Rising” brings this too-cool act to a climax as Allison finally admits to not being too cool to feel heartbroken; here, she drops the detached facade and allows herself to feel the true pain of the breakup. This pain is saturated by the lo-fi audio of the track; the fuzzy instruments and sound of a home recording give it a more relatable quality, which builds into a sonic climax, asking more from the listener than any other track on this album. As a debut album, “Clean” works masterfully, featuring carefully thought out structure and strong lyricism. At times, the song structure can be a bit straightforward and the topics are constrained to love and relationships, but Allison’s ability to put words to specific and widely shared frustrations carries her music beyond these limitations. Giving herself over so openly and honestly from the start through mature and poetic lyrics, Soccer Mommy’s trajectory is likely to be an exciting one for listeners to keep up with in the coming years. Equally reflective and vulnerable, “Clean” is the work of an artist just beginning to put her mark on the indie rock scene.